Running a business is a tough task and requires planning at every step. Making your customers grow attention towards your work is the first step in a long marathon. You might be an owner of a start-up or a multinational company, some things never change. But how can you build better customer relations? This is a question that every other business owner asks himself. But if you are reading this then you have come to the best place to bag solutions of your business needs. CRM or Customer Relationship Management software is a must, nowadays, for any business enterprise. With the help of this software, you can achieve a tangible boost in productivity. Zoho CRM developers are considered to be the best custom software developers of this sort. They have a great amount of experience and goodwill backing them up. How can CRM software help to boost customer relations? With a new age CRM module, you can take your business to a whole different level. Basically, this software is used to perform tasks like gathering data and increasing the reach. But not every CRM company will help you to reach the level you hope for. Zoho development services are well-known as they offer unparalleled amenities of customer relationship management development. With a customized cloud CRM solution, you can also have complete and in-depth access to data about your customers. Zoho CRM gives your customers an easy route to get in contact with you. This will also help to build a pretty sustainable and robust client relationship. They have a vast base of information, and it never fails to provide any data you may require. Zoho comes in with a ton of features that will help you to cultivate your business enterprise. 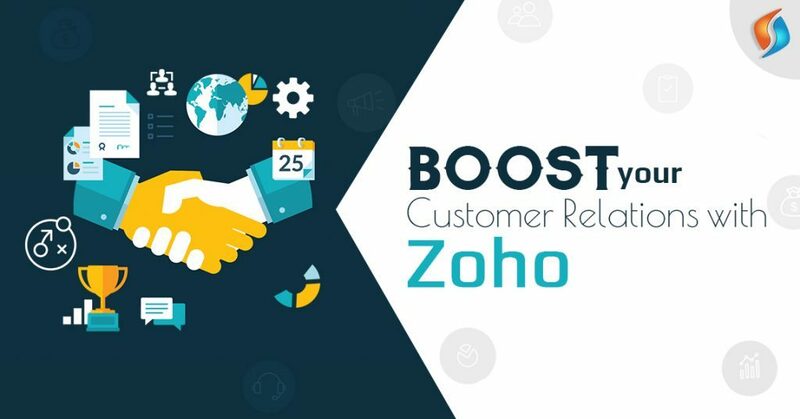 What are the features that Zoho CRM offers for boosting customer relations? With the help of this software, you can provide quality and efficiency to your customers. Many call centers prefer Zoho as their consulting partners. Zoho helps you to reach out to the prospective customers. Their CRM will make the first engagement with the client very pleasant. It drives in the traffic through several social media platforms. This is because increasing your reach is the prime goal of customer relationship management. It is important to know the taste, likes and dislikes of your customers. However, with CRM software you can dig deep and find out the most relevant information about them. So, this will give you the opportunity to reach them with a better plan and strategy. The presence of customer relationship management in business makes a lot of difference. When you reach your customers with the solution of their needs, it creates goodwill. Once this trust and goodwill take up the shape, a better and much strong customer relation comes into existence. Moreover, Zoho implementation partner will help your customers to reach to your technical team in a much better way. With the CRM intact, the descriptions of the problems will be on-point. This will result in quick solutions to technical issues. Not only this will increase productivity but also maintain your customer relations. Zoho Customer relationship management software is accessible on many platforms. The list comprises some very popular platforms like Android, iOS, blackberry. Compatibility is the showstopper and it works both online and online making it easier for customers to interact. How Zoho CRM works in boosting customer relations? Customer relationship management software works as the spine for any business enterprise. It enhances the productivity of the business. Zoho is a well-known brand for its premium CRM software and services. Moreover, with the help of Zoho CRM developers, you can build up the ideal software of your requirement. This will not only help your business to gain more revenue but also boost your customer relationships. Zoho CRM works in step by step manner to make the most out of the process. It not only works in its unique manner but also delivers the best to your customers. These following points show how Customer relationship management software boosts your interaction with your customers. Running a big scale business has its ups and downs. One of which is the aim for the perfect customer base. Zoho will help you to part the perfect region and customer base for you to aim. So, it is not an issue if your clientele has different needs. You will be offering them solutions in a better manner. Zoho CRM offers you a unique timeline feature. You can find all about the experience and collaboration history between you and your customers not just that you can even see details like which agent responded to whom. This will assist you to make a better plan before proceeding. The highly optimized Zoho CRM will make sure that you receive every notification firsthand. With no delays between the customer’s mail and your response, a better customer relationship will build. The Sales Signals feature also works wonderfully. It will notify you about everything a customer does. Also, you will receive all the notifications, from rating on your product or an order request. To make things much easier, CRM services allows you to survey your customers. This will result in a better bonding and a sense of knowing the needs and wants. You can also review the details and provide the right service to the customers without any hassle. With Zoho consulting services by your side, a boost in your customer relationship will be noticeable. Zoho Customer Relationship Management features a unique two-way data sync system. This allows a smooth and continuous flow of data and information between Zoho Desk and Zoho CRM. This increases both your productivity and revenue and not to forget the customer satisfaction. Zoho CRM development not only helps in building customer relationship but, also improve the ROI of your business. So, if you are looking for Zoho development services, then Signity is the best option for you. Hire our outsourcing team of Zoho experts and get a free quote today! !